King County finds most households who experience homelessness are first-timers, but a small number land back on the street repeatedly. The goal of its data system is to better understand how it all starts, and tailor how to respond. In all, Lewis has been homeless at least nine times, a number that surprised even her. Her story of homelessness is not the typical one. In the first eight months of 2018, 96 percent of households in King County who experienced homelessness were homeless for the first time. 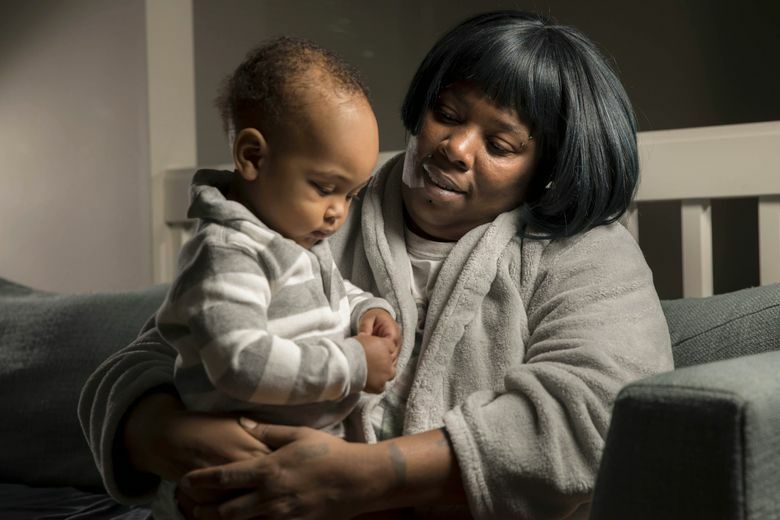 But about 4 percent, like Lewis, weave in and out of the system, repeatedly finding themselves back on the street because of a multitude of factors — in her case, struggles with her mental health, a criminal record and rising rents. Her story reflects that not everyone’s experience of homelessness can be neatly solved, nor do these experiences all look the same. And it’s why King County has spent the past three years building a data system to better understand who is becoming homeless, and how to tailor a more effective response. The need is critical: The number of people becoming homeless continues to outpace the number of people finding permanent housing. In 2017, King County households experienced more than 22,100 episodes of homelessness, the most recent year for which complete data is available. This number, higher than previous ones the county has released, reflects a new and potentially more accurate way to understand the scale of the homelessness crisis in the Puget Sound region. Identifying what’s known as inflow into homelessness could help to answer even bigger questions. What is the true scale of the need for homeless services in King County? How do you meet the needs of those experiencing homelessness for the first time, as well as those like Lewis, who’ve struggled for years to stay housed? For many years, King County’s only real measure of the homeless population was its annual point-in-time count — an imperfect snapshot largely based on the observations of hundreds of volunteers who fan out across the county on a single night every January. The count has become increasingly sophisticated in the past three years, but it counts homelessness only on that night — just over 12,100 last year, up from around 11,600 people in 2017. It does not tell how many people in the county have contact with the homeless-services system in a given year — a number that is much higher. A push for better data started here soon after then-Seattle Mayor Ed Murray and King County Executive Dow Constantine declared homelessness an emergency in 2015. 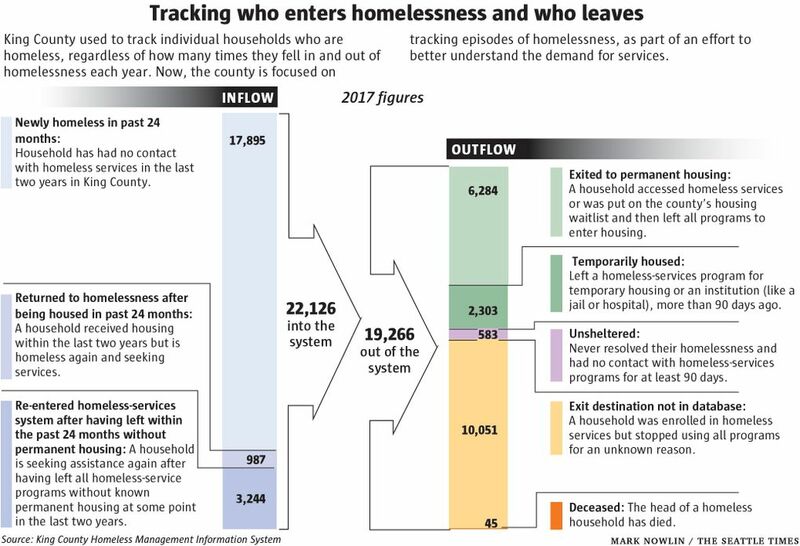 The next year, King County took over the region’s Homeless Management Information System (HMIS) — a federally mandated database that collects information about people who receive services — from the city. With grants from the Bill & Melinda Gates and Raikes foundations (both are funders of Project Homeless), the county built up its data analytics teams and worked with publicly funded providers to submit clean and complete data. With this better information, the county began tallying how many households became homeless — and left homelessness — every year. Focusing on households instead of individuals helps the county better understand the actual demand on available homeless resources, said Jennifer Coldiron, King County’s chief of performance measurement and evaluation for homeless services. Over the past year, the county has tweaked the system again, to look at episodes of homelessness — how many times a household gets a home, returns to homelessness or vanishes from the system completely. In this way, the county tallies how often a household touches the system, to get a true scope of the problem. What would it cost to house and provide treatment for Seattle's homeless? Why don't police enforce laws against camping in Seattle parks and streets? For example: Lewis and her family were sometimes homeless more than once in a single year. But under the previous system, they would have been counted only one time in a year, when they entered the system to access things like shelter or housing help. The county is still in the process of understanding why people are becoming homeless, but focusing on episodes of homelessness “begins to hone it more,” Quinn said. Constant data evaluation is key to turning off the tap into homelessness, Sandor said. And so is a community being prepared to change strategies if inflow numbers do not start to drop. For Lewis, the tap into homeless was very hard to shut off. In 2010, she moved her family out of their Skyway apartment after her son’s friend, 12-year-old Alajawan Brown, was shot and killed nearby. They eventually got another home in Columbia City until the middle of 2011, when they moved again because the rent went up. Then they ended up moving between cars and friends in Tacoma. The next year, there were 11,400 episodes of homelessness in King County. The county knows because they went back and analyzed inflow data for the past seven years. Since then, the number of people flowing into homelessness has increased every year, nearly doubling by 2017, and the count of newly homeless people (those who have not accessed homeless services in the past two years) was up 67 percent. Coldiron notes that King County’s overall population has gone up in that time, but only by about 9.1 percent. King County and Seattle have also seen another number on the rise, one that indicates positive change: households that left homelessness for some kind of permanent housing. That happened nearly 6,300 times in 2017, compared to 2,500 times in 2012, a 148 percent increase, even though the county is now “being more conservative about how we’re determining if someone is permanently housed,” Coldiron said. The data still isn’t perfect. Washington is the only state that requires people to “opt in” to being identifiable in its Homeless Management Information System. Coldiron said that is “certainly a data limitation”: About 30 percent of people in King County’s HMIS declined to opt in. That means some households are counted as new in the system every time they access homeless services. And even with the improved data, there is some missing information. In 2017, there were more than 10,000 episodes in which a household left the homeless-services system here and no one knew what happened to them. The county has tried reaching out to some of these mystery households. Some may have found housing on their own. Others, even if they’re found, may not engage with a case manager and are simply ready to forget what was likely a traumatic experience, Coldiron added. “In an ideal world, we would have resources to go and follow up with those people. Even when we have had that, often we can’t reach people,” she said. But county officials say, overall, the climbing inflow numbers show just how much demand there is on the system. As the county gets a better grasp on how many people are becoming homeless — whether again or for the first time — it is also getting closer to understanding the reasons why people lose their housing in the first place. Addressing these so-called “upstream causes” of homelessness was a major theme of the county and city’s One Table effort last year, which brought together governments, philanthropies, homeless-services providers and businesses, but produced few immediate, tangible results. The topic is increasingly being discussed in the region: How do other systems — such as criminal justice, foster care and mental health — feed into homelessness? Why are rates of homelessness so high among people of color, like Lewis? Lewis said she was diagnosed with schizophrenia at age 13 and has been hospitalized for behavioral-health issues many times. In 2005, she served 198 days in King County Jail for second-degree assault in addition to time spent at Western State Hospital, after pleading guilty to shooting her then-husband while she tried to escape from their home. She maintains she had no choice because her husband was repeatedly abusing her. Daniel Malone, executive director of Seattle’s Downtown Emergency Service Center, says understanding upstream causes is important, but he warns it isn’t a cure-all. He, like many other service providers in Seattle and across the country, argues that more affordable housing is the crucial need, particularly for those already experiencing homelessness. “We need to look upstream, but you can’t abandon what you’re doing downstream, because people are still in the river, (and) you’ve got to pluck them out of there,” Malone said. Service providers need to look critically at the systems that lead to homelessness, like the criminal-justice or mental-health systems, rather than focus on why individual people are homeless, said Jeff Olivet, CEO of the Center for Social Innovation, which is researching the intersection of race and homelessness in roughly a dozen U.S. communities, including Tacoma and Pierce County. “It seems like the homelessness system has often been … a passive receiver for all the stuff that gets dumped from other systems,” Olivet said. For example, more than a third of children who aged out of foster care in Washington were homeless or unstably housed within a year, according to a 2013 state report. The homeless-services system has historically not viewed dealing with upstream causes as its job, but Olivet sees that beginning to change around the country. Sandor’s Built for Zero initiative, for example, is currently studying what drives inflow in a handful of communities, including Detroit, Washington, D.C., and Clark County, Nevada. Locally, King County is in the process of merging its HMIS database with county Medicaid claims and behavioral-health information to understand if the same person is getting multiple services. Lewis last experienced homelessness in 2015, when she went to a shelter for the first time. In 2017, she and her family moved into Ronald Commons, an affordable-housing development run by Compass Housing Alliance in Shoreline that offers formerly homeless clients on-site, optional services. There, Lewis was able to stabilize her mental health. In August last year, the family moved into a condo in Newcastle, secured with a King County housing voucher. Lewis is on disability, taking her medication, checking her credit. She started a nonprofit with her friend to help gang-affiliated youth break the cycle of violence. And Lewis knows from years of experience what King County homeless providers and data experts increasingly understand, that the level of service and help one person needs to stay out of homelessness is not the same as another’s.